Following the Live show at the Fremantle Arts Centre THE DANDY WARHOLS will be heading to Geisha to celebrate ’til late. First up “The Morning Light” will vibe up the room with their live stylings before ZIA will be take over the decks giving us her favourite choons, eclectic as you may expect with everything from the 60′s to now. Some soul, R&B, some disco hip hop and electro thrown in for good measure….hell if its cool she will play it. 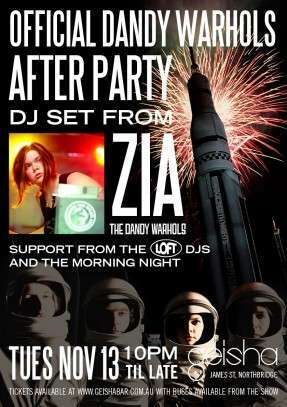 Zia will play until her fingers bleed or the dance floor beckons too hard. Then the LOFT Dj’s will keep the room pumping til late whilst the Dandies kick back for a bit of fun. Doors open at 10pm and we will be partying all the way thru to 4am. Numbers are limited and tickets WILL sell out so get in early. So come down to the monkey house because the Dandy Warhols Rule OK ! WE have 2 ticket types. Not If You Were The Last Junkie On Earth from The Dandy Warhols on Vimeo.